Madera Canyon, Arizona, is one of my favorite places to unwind, explore, and photograph nature. 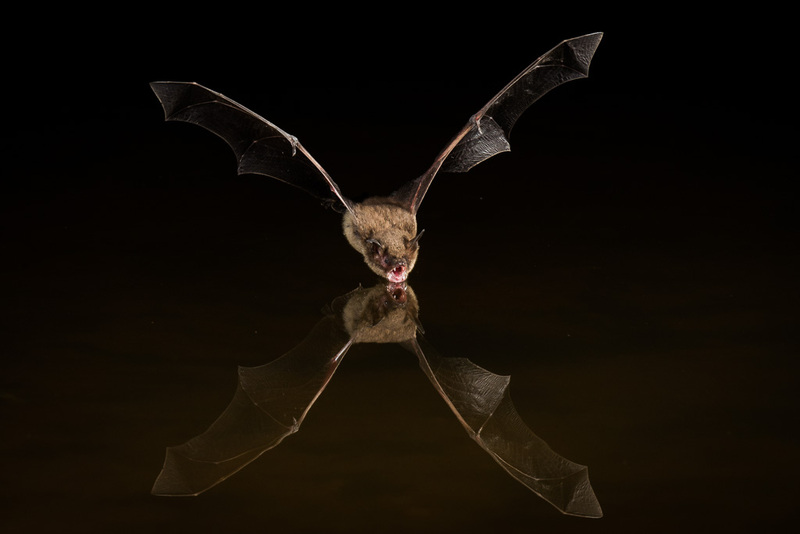 Just a few miles from the mouth of the canyon, Bill Forbes has a backyard pond that provides a unique opportunity to photograph bats in flight using a camera trap system called the Phototrap, which Bill builds and sells. With my sights set on capturing photos of Colorado’s rare flying squirrels, I thought trying my hand at bats would be a great way to learn the ropes of photographing flying mammals in the dark. Bill’s backyard is well known by birders as a go to spot for photographing Sonoran species like Gambel’s quail and roadrunners from the convenience of his many blinds. Indeed, upon arrival I immediately spotted a lifer bird, a striking male pyrrhuloxia, but the mammal geek in me was even more exited by the enormous antelope jackrabbits grazing on the mesquite bushes. 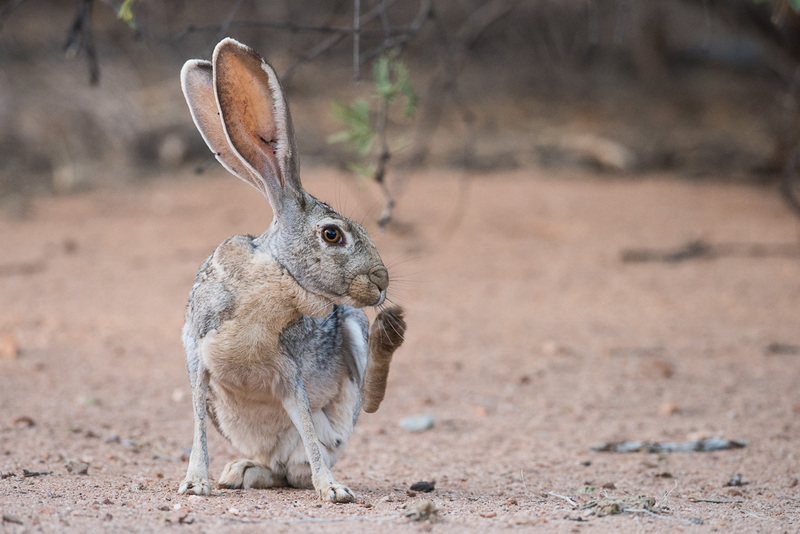 Photographing the ginormous antelope jackrabbit was an unexpected surprise. We set up and I got acquainted with the equipment. 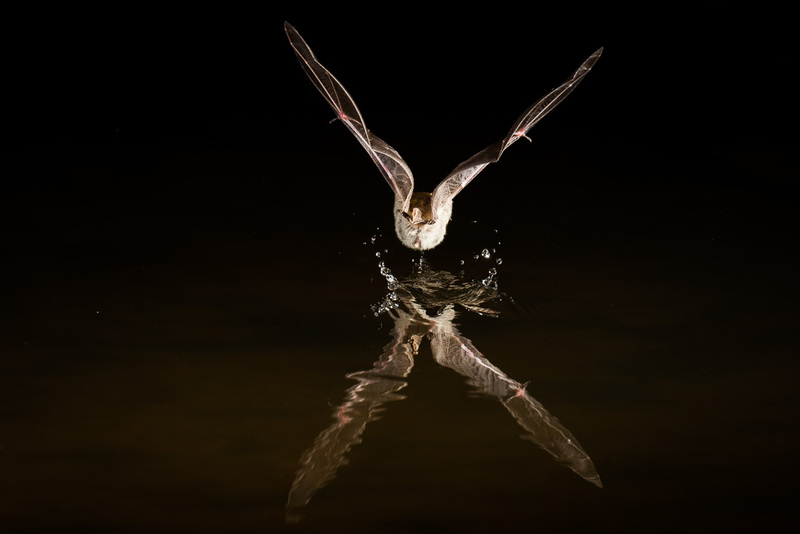 The bats would leave their roosts at dusk and predictably visit the pond for a drink, skimming the surface of the water with mouth open. With an infrared beam break sensor connected to the Phototrap controller, the bats would break the beam when they hit the sweet spot. 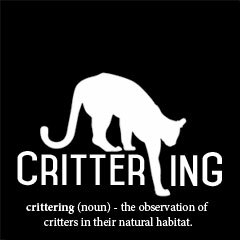 In a normal camera trapping scenario, you would typically connect the sensor to the camera which would then open the shutter and fire the flashes. For bats in flight, though, this configuration is too slow. In the split second it takes for the mechanical shutter on the camera to open, the bat has already moved out of the frame. The way around this is to keep the shutter on the camera continuously open, and connect the Phototrap controller directly to the flashes. In darkness, the flash creates the exposure in one burst of light equivalent of a shutter speed of 1/4000th, or even faster. A bat swoops in for a drink. I set up two cameras – one with a 600mm lens at the far end of the pond, and another with a 300mm positioned a bit closer. Before it became too dark to see, I prefocused both cameras on the point where the bats would break the beam and then set the shutter for continuous 15″ exposures. The easiest way to accomplish this is with a remote cable that can be locked into bulb mode, but the downside is that Nikon cameras are hard coded to shut off after 100 continuous shots. I think the intention is to keep the camera from filling your memory card with photos of the inside of your camera bag, but unfortunately there is no way around it for situations where you want to take more. If you can’t restart the camera every 25 minutes, using an intervalometer works almost as well. 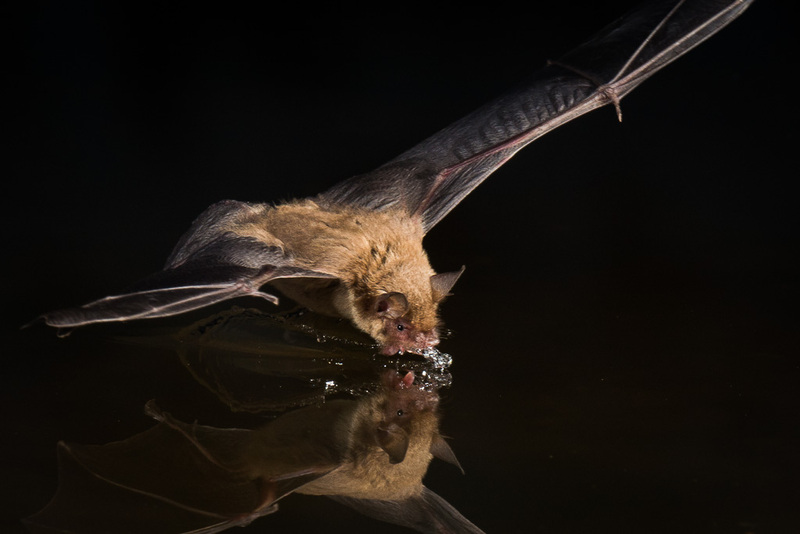 A close up of a bat drinking from the pond by skimming the surface. Once everything was set, all we had to do was wait for the bats for arrive. Bill has a closed circuit television watching the pond with infrared lighting, so we could watch the action without disturbing the set. Like clockwork, the bats arrived and began swooping across the surface of the pond. Sometimes they would come in at the wrong angle, or swoop back up before breaking the beam, but it wasn’t long before a burst of flash signaled that the beam had been broken. Although it was unseasonably cool and windy during my visit, there was still plenty of action and I brought back some exciting photos. I also lots of great ideas and practice that I hope will help me towards my goal of photographing flying squirrels in Colorado. You win some, you lose some. A bat going the “wrong way” through the camera trap. ← Are There Turtles in Colorado? Those are stupendous — congratulations. Thanks! Had a lot of fun with it. Super cool! I love bats. Amazing bat images James. Excellent.